It would be difficult to find a more interesting topic than the relationship between the news media and politics, especially given that Americans are now living in the "Twitter presidency" of Donald Trump. Academic research in the area of media and politics is rapidly breaking new ground to keep pace with prolific media developments and societal changes. This innovative, up-to-date text moves beyond rudimentary concepts and definitions to consider exciting research as well as practical applications that address monumental changes in media systems in the US and the world. This carefully crafted volume explores key questions posed by academics and practitioners alike, exposing students to rigorous scholarship as well as everyday challenges confronted by politicians, journalists, and media consumers. Each chapter opens with a "big question" about the impact of the news media, provides an overview of the more general topic, and then answers that question by appealing to the best, most-up-to-date research in the field. The volume as a whole is held together by an exploration of the rapidly changing media environment and the influence these changes have on individual political behavior and governments as a whole. 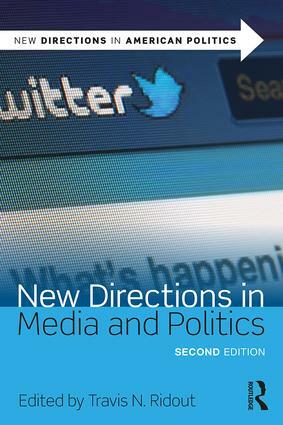 New Directions in Media and Politics makes an ideal anchor for courses as it digs deeper into the questions that standard textbooks only hint at—and presents scholarly evidence to support the arguments made. Fully updated through the 2016 elections and the early Trump presidency with a special focus on the role of social media. Adds three new chapters: The Move to Mobile; Media and Public Policy; and Fake News. Are Facebook, Snapchat, and Twitter Changing Elections? What’s the Impact on Citizen News Attention? Are They Good for American Democracy? Good for Campaigns but Bad for America? Does Media Coverage Depend on the Medium? What Is the Influence of Fabricated Stories and Efforts to Undermine Media Credibility?